Fans of 1960s mopefolk rejoice! Activision is releasing a new version of Guitar Hero featuring Leonard Cohen’s entire oeuvre including Suzanne, Bird on the Wire, and that one song that you listened to over and over again on your roommate’s turntable before he moved out and left you stuck with a $700 rent until you brought in that weird frat kid who ate Ramen and played Madden all day until you were like “Dude” and you found out he got kicked out of DTD because everyone hated him. 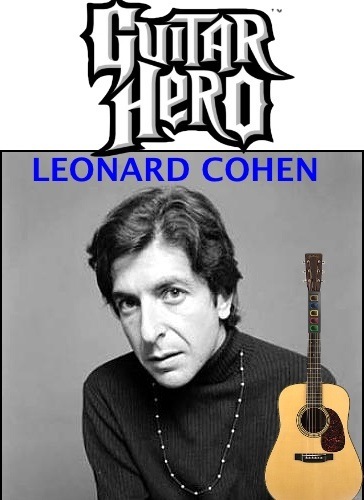 Leonard Cohen edition will be considerably slower than recent Metallica and the upcoming Katrina and the Waves edition, allowing older gamers to enter the world of casual gaming. The game will include a special Martin-styled guitar with real strings, allowing for actual arpeggio and endless stoned noodling. The new kit will cost $49 and should be available in June.